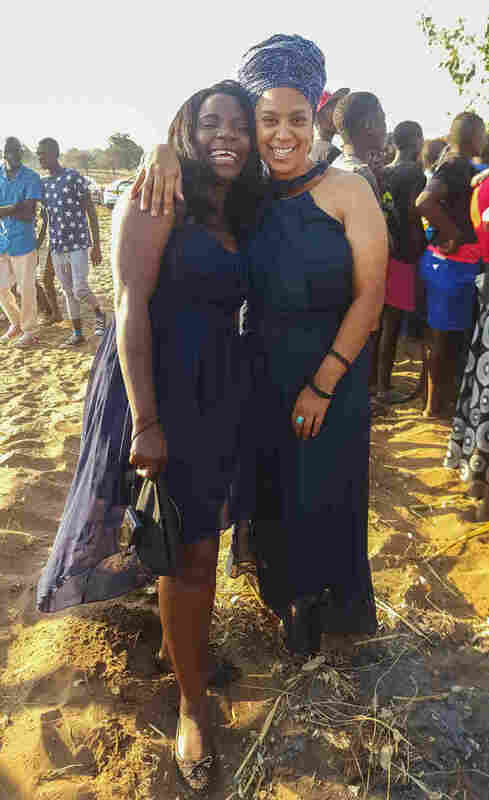 Former High School Dropout Joins Peace Corps, Helps New Dropouts In Namibia : Goats and Soda Stefani McCoy had it with school when she was a teenager. She turned her life around — and now she's helping Namibia's dropouts do the same. Stefani McCoy, seated in the center of the front row, was a high school dropout. 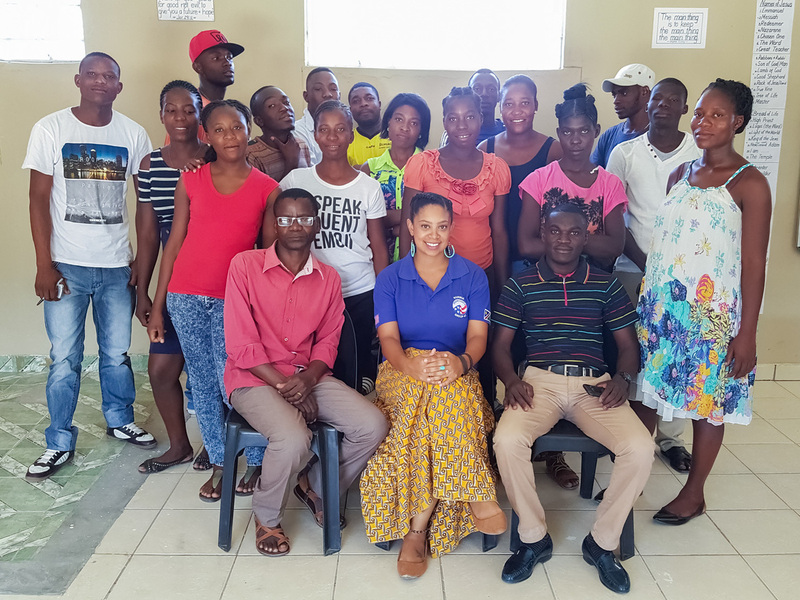 After going back to school and completing her college degree, she joined the Peace Corps and went to Namibia to help fellow dropouts. Back when Stefani McCoy was 17, she felt isolated and depressed. Her mother was raising her solo while her father battled drug addiction. One day, she decided she was done with going to school. "No one could talk me out of it," says McCoy, who soon ended up living out of her car. Eleven years later, she's in the Peace Corps, trying to help dropouts in Namibia in a similar situation. As McCoy says, "They're me in African form." Stefani McCoy, right, and her Namibian colleague Toive Pessa. McCoy is stationed in Rundu, on the northern border of the country, working with the local branch of the Community Skills Development Center (COSDEC). 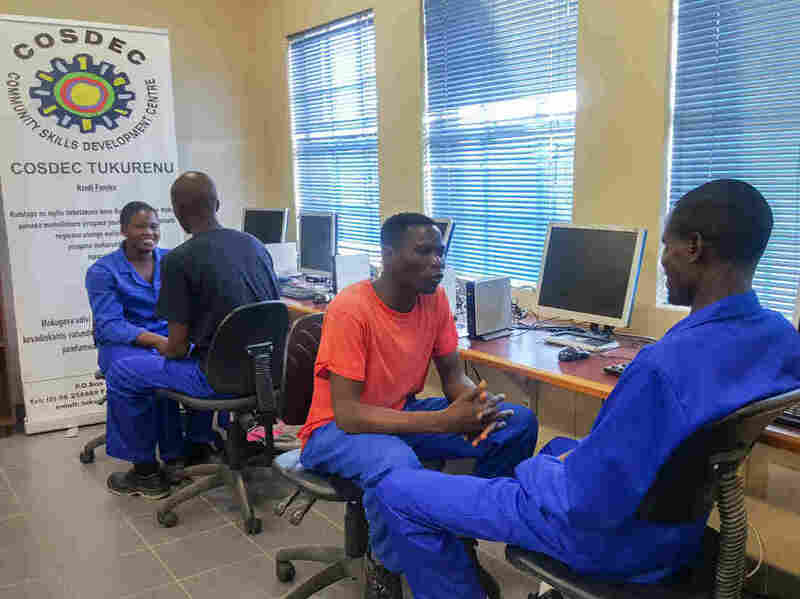 Its programs provide vocational training in areas such as plumbing and office administration for dropouts who want to enter the work force but lack the skills to succeed. Dr. Cynthy Haihambo, head of the department of Educational Psychology and Inclusive Education at the University of Namibia, says the other barrier is the grade 10 exam, which many students fail. "That's basically it for them," she says. And they join a worldwide pool of some 70 million secondary school dropouts. That's a figure that's been dramatically reduced from just a few years ago but it is still "a very big number," says Jordan Naidoo, director of UNESCO's Education for All. "Just having that completion [of school], it makes a difference in terms of employability." That was something McCoy realized not long after dropping out. So about a year later, she enrolled in night classes and got her diploma just before she turned 19. Determined to catch up, she raced through DeVry University in 2½ years, and immediately landed a management position at Enterprise Rent-a-Car. As nice as it was to have a steady salary, McCoy kept pondering her next challenge. And then she remembered the Peace Corps recruiter she'd met a few years back. That's how McCoy ended up in Namibia in May 2015, excited to use her skills to work with youth and promote economic development. When she toured COSDEC, the first thing she noticed was that it lacked a career services office. So she commandeered an extra room and got the project approved. "I said this is going to turn into something great," recalls McCoy, who set about offering mock interviews, job placement advice and long-term planning strategies. These sorts of lessons may be covered in Namibian secondary schools in "life skills" classes, Haihambo explains. But the curriculum of these courses varies, and poorer students almost invariably get less instruction in how to prepare for jobs. Because there are no guidelines for this type of instruction, "teachers do what they're comfortable with or what they know," she says. So perhaps it wasn't so surprising that McCoy's activities didn't go exactly as expected. "A lot of them didn't know how to use a computer, move a mouse or type," McCoy says. So she backed up and started with a basic computer skills class. Then, as she was describing what makes a bad interview or a good one, she was met with an odd reaction. "All of them were looking at me like, 'You don't understand my story,'" says McCoy, who now knows how different she seemed to them. She is an American who speaks English. She's multiracial. "To them, I'm not a traditional black person," McCoy explains. 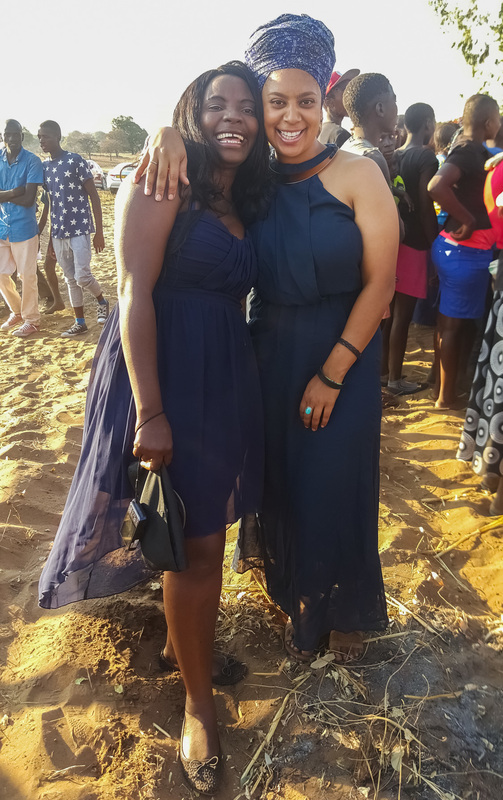 So she talked about her path to the Peace Corps, and her life back in the U.S. "In America, I'm as black as you are in Namibia," McCoy told them. The message resonated, says Pessa, who is McCoy's partner in the career services office. McCoy may use some unfamiliar terminology — "We say CV, but she says resume," Pessa notes — but her experience isn't as foreign as it might appear on the surface. And particularly at a place like COSDEC, that helps her serve as a role model. "They can see that anyone can drop out and become successful. You still have a chance to make it up," Pessa adds. Achieving that success, McCoy explains, is contingent on learning how to behave in the working world. That includes breaking some bad habits, like the tendency in Namibia to never look another person in the eyes. What she's learned is that kids here are taught not to make eye contact with adults. "When a parent talks to you, you must look down," McCoy says. This habit often becomes a reflex in all conversations. And that's a major no-no, she adds, when you're talking to a potential boss instead of your dad. She repeatedly reminds her students: "You can look at me." Mumbling is another issue. McCoy's method of dealing with that is to call out, "I can't hear you." It becomes a rallying cry for the entire class, which really encourages students to speak up. This is particularly critical for the women, who tend to be much more reticent. "Imagine growing up in a traditional home," McCoy says. Women and girls stay inside the house, taking care of chores, while men and boys go out into the field, where they have more social interactions. So she tries to instill the lesson in her female students that "your turn is any turn," and when they have something to add, they should say it. "Do you understand?" McCoy asks them in their native language of Rukwangali. McCoy has learned that humor can work wonders. When students are nervous during a mock interview, she tells them to imagine her naked. "They all bust out laughing," she says. Silly stuff helps them tackle some serious questions, like, in an interview, how do you explain to a potential employer what you did after dropping out. For many students, that time was spent at home, helping with their families. McCoy's advice? "They won't focus too much on the gap if you're able to articulate the experience you have." There's been no better experience for McCoy than watching her students use these strategies to help get jobs. She can't take credit for their hard work, but she's proud of the role she played. "I helped them believe," McCoy says. One student in particular stands out: 24-year-old Haita Ester. In many ways, she's typical — Ester completed secondary school up to grade 10 and is raising a five-year-old daughter. Before going to see McCoy and Pessa last year, Ester says, she wasn't familiar with "career development." But she is no shrinking violet. "The first time I met her, she came up to me and had all of these questions," McCoy says. "It's refreshing to see a woman I don't need to encourage to speak." The answers gave Ester a lot to ponder as she completed her office administration certification. She started considering how to conduct herself in interviews, how to behave in a professional setting, how to create long-term career plans. "It just really helped me put my thoughts together on how to be more successful and focused on my future," explains Ester, who now has a government position as a receptionist. It's a good job, but Ester continues to take classes on the side. "I will still go for a diploma," she says. Vicky Hallett is a freelance writer in Florence, Italy. She was previously a reporter and fitness columnist for The Washington Post.